If you are currently a QAS staff member you can register here at no cost. 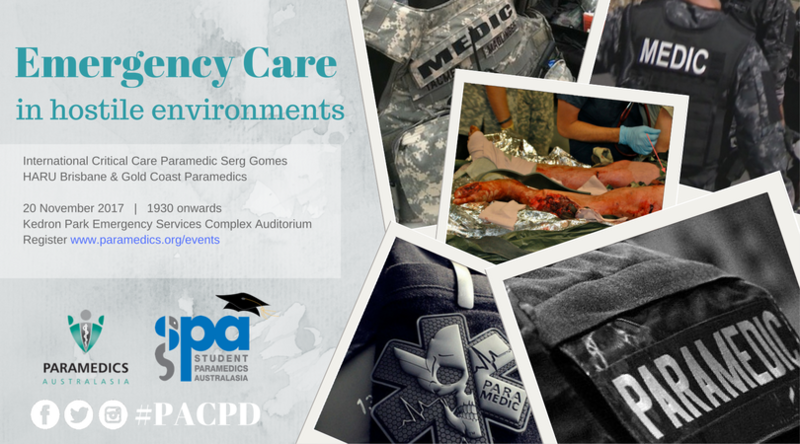 International Critical Care Paramedic Serg Gomes has lived & worked in various hostile countries around the world, most recently in Iraq & Afghanistan. A veteran South African Paramedic & former Police Officer, Serg will present some experiences & learnings & share with you some valuable lessons. QAS HARU Critical Care Paramedics from Gold Coast & Brisbane will present skills stations focusing on trauma care, specifically the use of the CAT tourniquet, Israeli bandages, pelvic binders, Rapid Sequence Intubation & the CT6 splint. Cost is $15 for non-PA/SPA members. PA/SPA members this forms part of your membership. Refreshments provided.